Blue jeans will always be classic and cool, but the strength and confidence of crisp white and sharp black has an equally powerful draw. The only problem: these strong colors can require some extra attention. 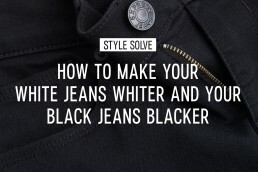 Keeping your white jeans white and your black jeans black takes just a little elbow grease, but if you ignore the upkeep altogether, it won’t be long before you’re in the gray—literally. To help you keep your denim looking sharp, here are a few helpful hints. We’ve also included a few points on maintaining garment-dyed denim. Why? Because you know you want some red jeans this summer. Use spray-on fabric protector to guard your white jeans against future stains, especially if you’re a fan of the following: BBQ, pizza, red wine, hanging out in the grass, and art projects (a.k.a. pretty much all of us). Don’t go overboard with washing. Bleach will cause white denim to yellow over time, and excessive washing can break down the fibers, leaving your jeans prone to rips and tears. Treat stains the right way. Rinse with warm water. A little glycerin-based soap will lift ink spots while concentrated dish soap can combat most other stains. For a red wine stain try a little hydrogen peroxide. If the stain is oil-based, skip water and sprinkle some baby powder on the stain. Leave overnight. Dedicated denim heads will avoid washing their black jeans at all costs, but there’s a happy medium here if your freezer is already full. Simply wash your jeans inside out in cold water on a gentle cycle and let them hang to dry. If you really want to go the extra mile, dunk your jeans in a bucket of cold water with 1 cup white distilled vinegar before washing. This will help set the jeans’ dye and prevent them from fading in the wash. Try dying them again or refreshing the color. Some dyes are specifically formulated to revive faded black clothing. Simply pop the sachet in the washing machine and your jeans will come out looking like they did on day one. Follow the same washing instructions for colored denim as your black jeans: inside out, cold wash, gentle cycle, hang dry. The lack of heat is beneficial for all dyed denim, not just black. Buy a detergent specifically engineered for colors, or wash your jeans using distilled white vinegar which is much gentler yet still effective at lifting dirt and stains. Avoid excessive exposure to sunshine (not you, the jeans). Hanging your wet jeans on the clothesline—or, if you’re the scrappy type, on your deck chairs—is logical enough. But remember: the sun will turn sun-faded jeans into sun-bleached jeans in no time.